Platforms for passenger trains are typically high-level platforms in Japan, unlike the U.S. which only uses high-level platforms at major stations, and uses steps (and small platforms for wheelchair access) at most intermediate stations. Low-level platforms are thus not typical of Japanese models of stations. But there is one exception: light-rail. While some light rail lines use high-level station platforms, others use lower platforms. Tōkyō’s Toden Arakawa and Tokyu Setagaya lines appear to use intermediate level platforms about 75 cm high, while Toyama’s Toyamakō line appears to use platforms closer to 25 cm (although it’s hard to be exact). In Japanese N-Scale, these equate to 5 mm and 2 mm in height (above the rail, not above the base of shaped ballast), respectively. Kato has recently introduced several low-level platforms, which could be very handy for urban light rail modeling. This page provides an overview of these. Note: As these are Kato platforms, they’re designed for Kato’s track. Many light-rail modelers use Tomix’s FineTrack for light rail, and using the two together poses some problems. First, FineTrack’s molded base has a different and narrower profile, so the platform would need to be spaced away from the base to avoid hitting trains (and there would be a gap in the side of the platform with the 23-140 set due to its contour). 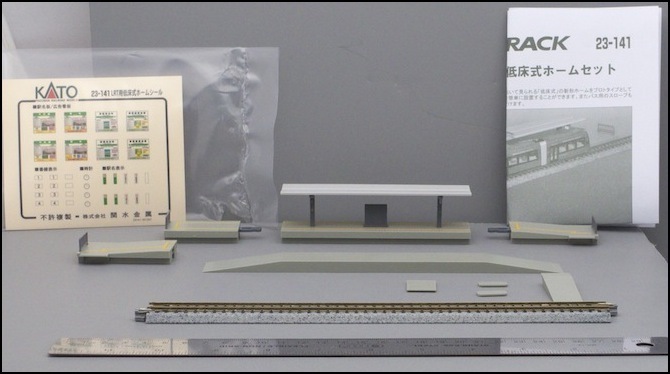 Second, Unitrack’s railhead sits about 2mm higher than Finetrack’s, which would make the platforms too high. While difficult to notice, it might be desirable to raise FineTrack on a strip of styrene to provide the correct height. I have a musing that covers my first impressions of the two new Kato low-level platforms. This set consists of two side platforms that are of fixed length, not modular like most of Kato’s passenger platforms. They come with two bases held on by screws. One lets them sit beside Unitrack, with a shape that fits against the molded ballast. The other lets them sit atop Unitram street track (in the latter, the platform itself is lower since its base starts out at track level). The platform comes with railings and a bench preinstalled, plus one double signboard. There are no detail parts to add. The awning is a ribbed structure, looking quite good, but in a very garish orange color that’s really too bright. A yellow textured strip is molded into the platform and down the upper ramp (but not the lower section, which is a curious omission) as a guide for the visually-impaired. Platform height is about 5 mm above railhead, making these suitable for Tōkyō’s lines. They even look similar to some of those stations, notably the longer ones of the Setagaya line. Each platform is just 10 mm deep, part of which overhangs the Unitrack base. This set consists of a single island platform section, with three ends (two ramps and one non-ramp), plus a parallel bus ramp to raise a road up to just below platform level, and parts to extend the platform ramp across one or two tracks. Although this station is designed for low-floor trams, it is designed to work only with Unitrack, not Unitram track. The platform comes with no add-on parts, just an awning and central signboard. The awning is a flat sheet of white, slightly angled down towards the center, with no ribbing or other texture. A yellow textured strip is molded along both sides of the platform, and down the ramps as a guide for vision-impaired persons. Although this is a sectional platform, it uses Unitram clips to hold adjacent parts together, not S-Joiners. Additionally, there are no other sections sold separately at present. To make a longer station, or platforms on both sides of the track, requires buying additional copies of the full set. Platform height is about 2 mm above railhead, making it suitable for low-floor trams like the Unitram. Each platform is 30 mm deep, and has no back railing, making it too wide for a side platform of its length, and unsuited for that use (likely the reason they include the bus ramp). It is also too narrow to fit between Unitrack at the usual 66 mm center spacing, and in fact exactly fits between Unitrack at a 50 mm center-to-center spacing, which isn’t really a spacing you can get with Unitrack, although you can get close with a #6 switch and a 124mm straight. All things considered, this platform comes off looking oddly toylike in comparison to the 23-140 set. I don’t have one of these, but it appears to be a multi-segment version of the 23-141, with two roofed sections (referred to as “Island Home Formula A”) and one roofless section (“Island Home Formula B”). This is intended to replicate a Swiss station, and comes with European-language signs. This is a pair of side platforms for use on Unitram street track (lacking the base for Unitrack use that comes with the 23-140). They aren’t the same kind of station as the 23-140, having a curved translucent roof and back, more reflective of an urban street station. It comes disassembled, but is otherwise very similar in design to the 23-140.